Many congratulations to Chineke! French Horn player Adedeji Ogunfolu, who has recently been appointed second horn of the Pacific Symphony in California. We caught up with Adedeji, asking him a few questions about his experiences, what Chineke! means to him, and any advice he might give to aspiring musicians. From my first introduction to classical music, I knew that performing would be a large part of my life in some capacity. When I was a kid, I would watch classical music broadcasts on PBS and other public access television platforms. I would use my allowance to buy CD's of my favourite artists. I played cello, trumpet and piano before settling my focus full-time on the French horn. What do you wish someone had told you when you were first considering becoming a musician? I wish I was told to enjoy the process of growth more. I spent a lot of time lamenting over not being exactly I wanted to be as a musician, both musically and technically. As cliche as it sounds, everything happens in its own time. I am 31, and still feel like I am getting better as a horn-player. Sometimes I surprise myself! How did you first hear about the Chineke! Foundation? What did you initially think of the idea and has that changed since you have been involved? I initially saw a YouTube video of the Chineke orchestra approximately three years ago. A few months later when Chi-chi contacted me asking me to perform with the group, I leapt at the opportunity. I had never been to London, and I had a chance to play with some phenomenal musicians. Definitely a win-win! I was familiar with the premise of Chineke! through my affiliation with the Sphinx Organization in the states. So the idea of Chineke! was not completely foreign to me. I was happy to shine a light on diversity in classical music. Have you found that there are any specific challenges associated with being a BME musician? If so, what are they? I think the biggest challenge for me being a BME musician is not seeing yourself as you see peers from other backgrounds. That reality does not make me enjoy my profession any less, but when you are the "only one" that reality can be somewhat isolating. How has playing with Chineke! helped you/your personal development as a musician? Chineke! reminded me to stay flexible and to keep an open mind. Playing styles and interpretations can vary vastly depending on where you are in the world, and all approaches are valid in their own ways. I would say find examples of role models with whom you identify. For me that was Jerome Ashby, former Associate Principal horn of the New York Philharmonic. He continues to serve as inspiration for me to this day. The first time I laid eyes on him was watching a New York Philharmonic broadcast. Seeing Mr. Ashby also made me know that it was possible to pursue this career. Adedeji Bailes Ogunfolu is the newly appointed second horn of the Pacific Symphony, where he will commence his duties in September 2018. He also is a member of the San Antonio Symphony, a position he was awarded in 2014. 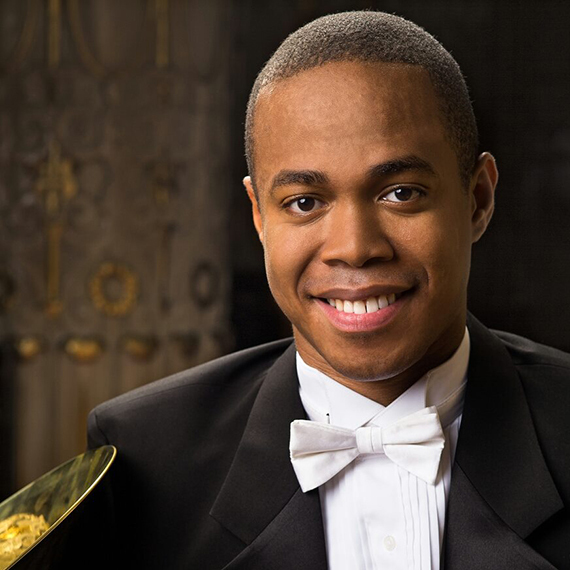 Prior to his appointment in San Antonio, Adedeji was a fellow for OTPAAM [Orchestral Training Program for African American Musicians] with the Pittsburgh Symphony Orchestra. He has also performed with the Detroit Symphony Orchestra, Windsor Symphony Orchestra, Flint Symphony Orchestra, and in April 2018 performed as acting principal horn with the Los Angeles Chamber Orchestra. For the past four summers, Adedeji has performed as section horn with the Lakes Area Music Festival in northern Minnesota. Other musical accomplishments include winning the concerto competition at the Colorado College Music Festival and winning the Solo division of the Northeast horn workshop. He was also a fellow at the Tanglewood for two summers. Adedeji is native of Washington D.C. He began his college education at the University of Maryland, College Park and finished his undergraduate degree at the Curtis Institute of Music in Philadelphia. Adedeji went on to complete his master's degree at the University of Michigan, Ann Arbor. His major teachers include Gregory Miller, Jennifer Montone, and Adam Unsworth. He has had additional studies with Bryan Kennedy, Denise Tryon, and William Vermuelen.